Is Online Gambling Legal If Bitcoins, Not Dollars, Are At Stake? : All Tech Considered With no government ties, Bitcoin is used to buy everything from blogging services to Brooklyn-made cupcakes. Theoretically, millions of dollars are being kept in the digital currency. And it's increasingly being used by specialized websites to offer online gambling. But is Bitcoin gambling legal? 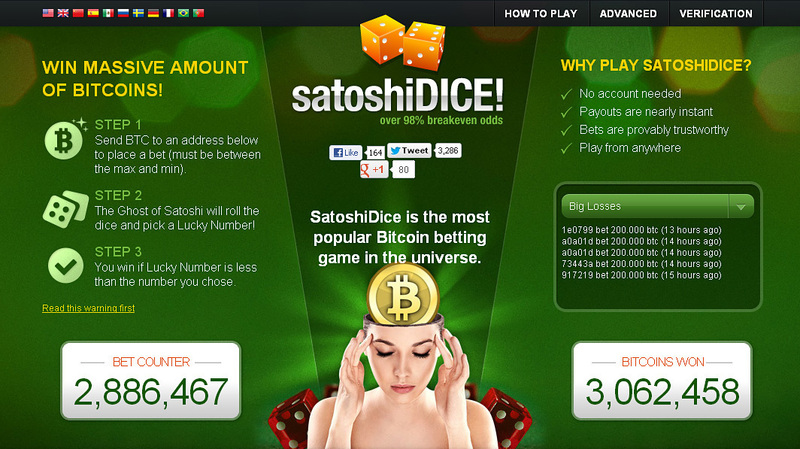 An image depicts the SatoshiDice website, which exclusively uses Bitcoin, not dollars, for gambling. With no government ties, Bitcoin is used to buy everything from blogging services to Brooklyn-made cupcakes. Theoretically, millions of dollars are being kept in the digital currency, and it's increasingly being used by specialized online gambling websites. But is Bitcoin gambling legal? Purely in the interests of journalism, I decided to get my hands on some of the currency. When I did so, Bitcoin, which has been around for a few years now, was fetching around $17 on most exchange sites. It has since risen to more than $20. It turns out that it's really easy for someone to give you Bitcoin, but it's less easy to just buy them from a third party. I ended up asking a friend with some Bitcoin to help — I told him I'd buy him a couple beers later. So, I created a Bitcoin account, and he shot me a few. The first gambling site I tried was SatoshiDice, an online dice game specifically designed for Bitcoin. Honestly, it's a pretty boring game. You just bet on whether a random dice roll will come up below a certain value. After I bet 0.02 Bitcoin, SatoshiDice sent an email saying I won. So, I bet the equivalent of 34 cents and I won 38 cents, meaning I came out a little bit ahead. The federal government says online gambling is a no-no. In the last few years, the Justice Department has made it very clear: You can't just open up an offshore casino online and start taking bets using actual money from the United States. But last year, a couple of entrepreneurs asked themselves — what if you were only betting with Bitcoin? "What Bitcoin does is that it totally circumvents that," says Jerry Brito, who studies the currency as part of his work as a senior research fellow at the Mercatus Center at George Mason University. "There is no Bitcoin company, there's no Bitcoin building that regulators can get their hands on. It's basically cash." This month, Brito has been following news of SatoshiDice's financial reports. The dice-game company says it made the equivalent of over half a million dollars in profits in just six months of operation in 2012, accepting bets in Bitcoin. But that betting could turn into a legal black hole. After all, no one knows if Bitcoin is money, a financial instrument or something else. "We don't have a bank account at Seals with Clubs," says Bryan Micon, the spokesperson for SealsWithClubs.eu, a Bitcoin-based poker site. "There's no bank account. There's no bank of any sort that we do. We only do this one weird brand-new Internet protocol transaction that some of the nerds out there are calling money." Micon says it might be tough for the Feds to regulate what is just a piece of computer code and not real money. I started to wonder if I broke the law by gambling online using Bitcoin. So I called the Justice Department. It declined to comment for this story. But here's the thing with gambling with Bitcoin: My winnings are still in Bitcoin. It's up to me to convert those back into dollars. And that extra step is deliberate, says Brito of George Mason University. "The fact that they are doing that seems to suggest that they themselves are not 100 percent sure that this will be seen as perfectly legal by regulators," he says, "wherever they're based." For now, I still have 0.8 Bitcoin in my account, worth about $13 — assuming that it's not raided by the feds.